if Ban’s performance continues to draw criticism. 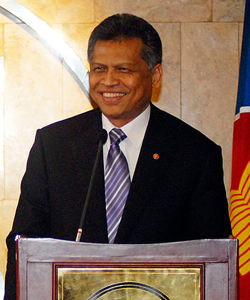 U.S. officials were pushing for Pitsuwan to enter the race in 2006, according to the Bangkok-based The Nation, and believed his candidacy would have also received China’s support. If “people in the circles of Susan Rice and Hillary Clinton [remain] very negative to Ban,” the United States-ASEAN summit later this month may provide them an opportunity to evaluate Pitsuwan as a candidate and possible replacement for Ban. A Pitsuwan candidacy would ensure that the “Asia’s turn” at the Secretary-Generalship continues through the traditional second term, making Ban’s replacement much less antagonistic toward Asian governments (read, China).